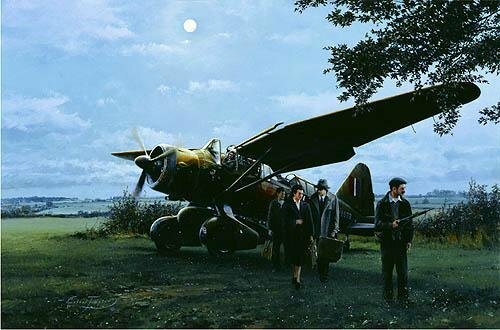 Robert Taylor captures to perfection the secret world of the Special Operations pilot with his atmospheric painting They Landed By Moonlight. Packed with tension, he recreates the high drama of a typical rendezvous as a pilot from No. 161 Squadron based at Tangmere, readies his Lysander aircraft for take-off in a remote field deep inside occupied France. Clutching a Luger in one hand, he completes pre-take off checks as three passengers are spirited away by an armed member of the French Resistance. It is July 1943. Overall Print Size: 30" x 23"